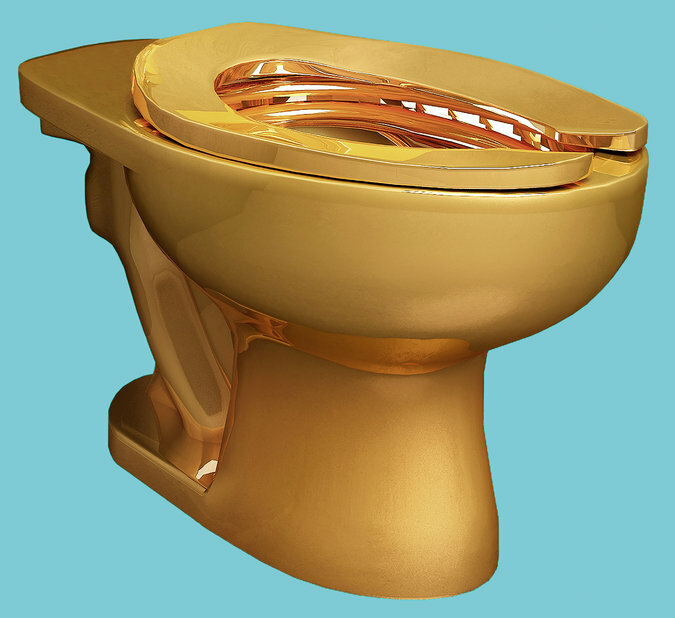 Below is an image of an 18-carat solid gold toilet. It was made by artist Maurizio Cattelan and loaned to the Guggenheim Museum in New York last May, just in time for the spring season of art fairs. Unfortunately, as I noted in a May 7 post — “Art’s Shock Jock” — the toilet did not work. Last week it was announced that the toilet, which the Italian artist named “America,” is now functional. There were reports in the news of arts fans who had tried the golden toilet and affirmed that it did the job for them. There has not been much discussion of why the toilet was named “America,” but my inner skeptic suspects that it is not an homage to our country. The toilet now resides in the Guggenheim, where it probably will stay until a wealthy investor wants to purchase it. Meanwhile, a full-time guard is on duty nearby, which is only to be expected in a country where people steal flip-flops in the changing room at the gym. Over the last 40 years, many old toilets have been replaced with newer, more water-efficient models. In some parts of California, the government will give you as much as $150 toward a new throne and carry your old one away. In other parts of the country, people have tried to find new uses for old toilets. One favorite use, which I have seen only in photographs, is as a planter. Here is one example; there are hundreds of other such pictures on the internet. Personally, I cannot recommend this look. 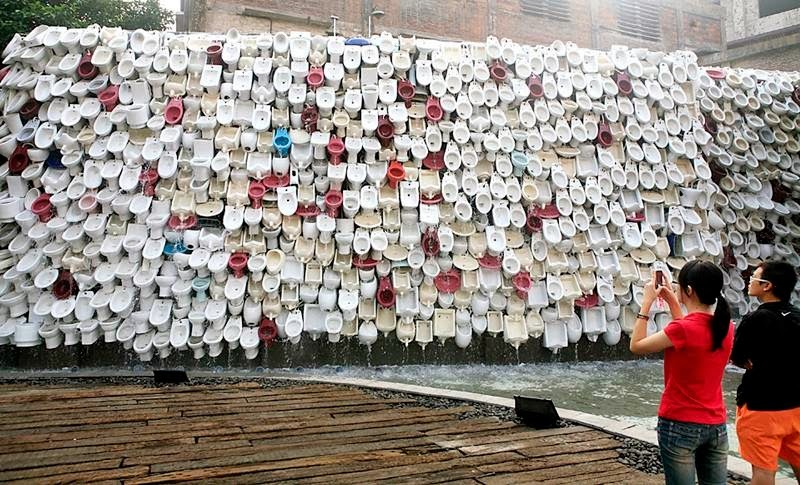 This is called “A Waterfall Built out of Recycled Toilets,” which was mounted by artist Shu Yong and his team during the city’s Pottery and Porcelain Festival. All 10,000 toilets were synced up to a single tap, and when the tap was turned all the toilets flushed at the same time, creating the waterfall. Pretty ingenious, if you think about it, and particularly impressive compared to the Guggenheim’s four-month effort to get just one single toilet to flush. 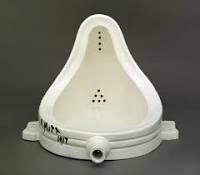 Sometime around 1917, Dada artist Marcel Duchamp bought a porcelain urinal from a supplier, signed it R Mutt and submitted it for an art show in New York. A few years earlier, a more conventional work of his had been rejected for an art show, and he was said to be offended by this. New things were happening in art at the time, and his belief seems to have been that if an artist said a particular piece was art, well, it was art. If you think about what we’ve seen in art since that time, the notion makes a certain amount of sense. The original Duchamp urinal has since disappeared, but the Tate Museum in London has the copy pictured below. Please note: In the artist’s original display, the work was positioned reclining on its back, not upright as shown here. Think about Andy Warhol encountering this piece as a young man. If this is art, he may have said to himself, why not a Brillo box or a Campbell Soup can? At that time, when the unsophisticated public was puzzled by and/or weary of Abstract Expressionism, Pop Art gave people recognizable images that were more understandable. The large picture is that art is a continuing conversation. 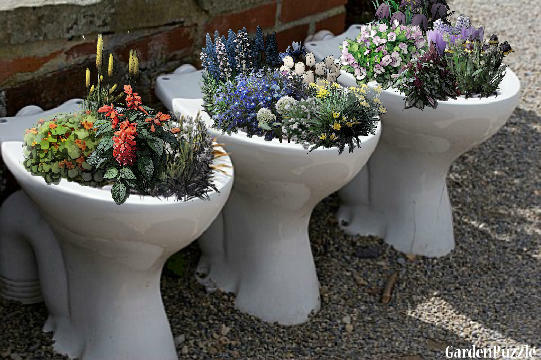 Most art (including, I’m guessing, toilet bowl planters) is forgotten over time, but certain ideas resonate and move the conversation forward. I’m not sure that the golden toilet will be donated to and featured in a museum 200 years from now, but Duchamp’s urinal idea is nearing its centennial and still is part of the discussion.